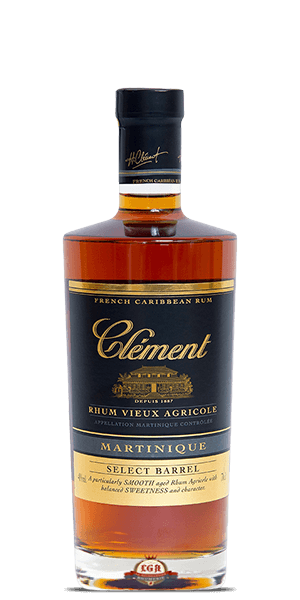 Clément Select Barrel is a lovely classic Rhum Agricole from the island of Martinique in the French Antilles. Martinique was a powerhouse of sugar production in the 19th century, but eventually the business went bust. The mayor of Le François, Homère Clément, whose name is printed on this bottle, decided to use sugar crops to produce Spirits. Imitating the methods of Cognac production, he created Rhum Agricole, which is made from freshly squeezed sugar cane juice rather than molasses. Clément's Select Barrel is a bottle of rich Rum, perfect for an evening party and ideal for people who usually drink Whisky - when you pop it open, sweet aromas of peated Whisky emerge. Select Barrel Rum is aged in French Oak casks, carefully selected by the cellar master, for three years, and since the boys and girls in Martinique use Cognac grading, this delightful potion is a VS (very special). The Rum is fantastic in a role of a mixer, especially in cocktails such as Amber 'Ti Punch, Martinique Mai Tai, and Creole Sidecar. What does Clement Select Barrel Rhum taste like? The Flavour Spiral™ shows the most common flavours that you'll taste in Clement Select Barrel Rhum and gives you a chance to have a taste of it before actually tasting it. Faint aroma of coffee followed by heavy mushroom and vegetal notes with an apple character. Tart apricot, peach, banana with notes of vanilla, spearmint and rosemary. Hot finish with fresh and nuanced lingering flavors.